Schmartboard|ez 1.27mm Pitch SOIC Surface Mount Prototyping shield for Arduino Uno (Without Components) (206-0004-01) - Schmartboard, Inc.
Schmartboard has made surface mount components available to Arduino users. These boards utilize our "EZ" soldering technology to assure fast, easy and flawless soldering. Once upon a time it was easy to prototype a circuit by hand soldering components on to a prototyping board, using wire wrap techniques or a breadboard. Today, our advanced electronics require the use of small and tight pitched components. It’s made it almost impossible to prototype. Schmartboard, and only Schmartboard, has solved this conundrum. Never before has it been so easy to hand solder surface mount components. 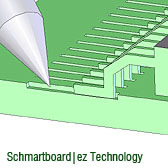 Only Schmartboard has a patented technology that makes this possible. "Schmartboard|ez" makes it easy to solder SOIC, QFP, QFN and other component packages with pitches as small as .4mm. If you want to use surfacemount on Arduino, Schmartboard is your only option. Click the button below to add the Schmartboard|ez 1.27mm Pitch SOIC Surface Mount Prototyping shield for Arduino Uno (Without Components) (206-0004-01) to your wish list.